Despite being the UK’s third most popular pet, with an estimated 1.6 million currently kept. Rabbits have been identified as the MOST neglected and cruelly treated pet. We are petitioning to urge the UK government to introduce a code of practice for the welfare of domestic rabbits. For our petition to be considered for debate in the house in commons we need to get 100,000 signatures in one year. Sign the petition here - Thank you! We desperately need YOUR help! Please help us to acheive our goal by signing the petition yourself. We also need your help sharing the petition. Please help us by pledging to get us as many signatures as you possibly can. Please ask family, friends, and share, share, share! If you would be able to feature our petition anywhere on your own website/blog we'd absolutely love to hear from you. Please feel free to share our video/any images on your own website in order to promote the petition. We'd also love to hear from you if you would like leaflets to promote the petition at an animal related event etc. Please download a campaign poster and ask your vets etc. if they can display one on our behalf. Rabbits do not have a voice - we must speak for them. The issues surrounding the current rabbit welfare crisis in the UK are complicated and there is sadly no quick fix. However, we believe that the first step towards an improvement in the lives of the UK's pets rabbits is for the government to acknowledge their importance and to introduce a code of practice for the welfare of domestic rabbits. Codes of practice currently exist for the welfare of dogs and cats. These outline what is needed for these animals to be correctly cared for and what is needed to comply with the Animal Welfare Act 2006. These codes of practice also help the courts decide when an animal welfare offence has been committed. Huge thanks to therabbithouse.com for this very informative blog post which explains the importance of a code of practice in addition to the current Animal welfare act. Wales introduced a code of practice for rabbits in 2009, the rest of the UK needs to follow their lead. We must make sure that the government knows that the UK public is strongly behind addressing the current rabbit welfare crisis. We need them to implement the recommendations currently being drawn up by the Companion Animal Sector Council which includes the wonderful Rabbit Welfare Association (the authority on rabbit welfare in the UK). 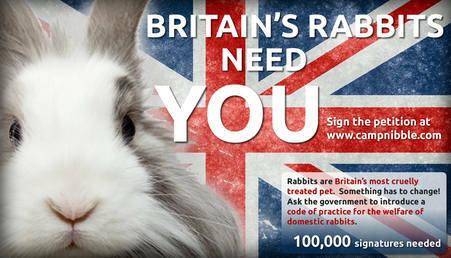 Huge thanks to bunnyhugga.com for their news article on their website and for designing our brilliant campaign poster. 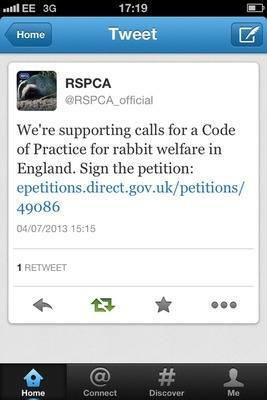 Huge thanks also to actionforrabbits.co.uk for all their help and support with sharing the petition. Already signed and shared the e-petition?